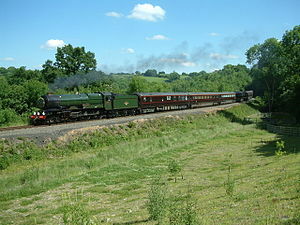 Significant events in the history of the Severn Valley Railway in preservation between 2000 and 2009 are set out below. 2000 saw the railway hit by a ‘boiler crisis’. March 2000: The ‘Branch Line Weekend’ saw two visitors, South Devon Railway’s GWRGreat Western Railway 0-4-2T no 1420 with auto coach and Mid Hants Railway’s LMSLondon Midland & Scottish Railway IvattHenry George Ivatt, Chief Mechanical Engineer (CME) of the London, Midland and Scottish Railway 1946-1948. CME of BR (London Midland Region) 1948-1951 2-6-2T no 41312. April 2000: The keys to newly completed Kidderminster Carriage Shed were formally handed to the SVRSevern Valley Railway by the Carillion site manager on 19 April 2000. The same day saw the first rake of carriages propelled onto Road 1. May 2000: 3205 re-visited the Railway, pulling a 30th Anniversary Special on 23 May. June 2000: Laying of track in Kidderminster Carriage Shed by the P-Way staff was completed during the month. Summer 2000: The railway experienced a succession of boiler failures, decimating the normal working fleet. Even 813 was pressed into service, hauling a number of 4-coach trains. The railway managed (just!) to include steam on every weekend, but the Diesel fleet was heavily used. A number of reasons for the crisis were later identified, including a combination of water quality (despite the use of approved chemical treatment), type of coal used, and methods of firing. The failures had a ‘domino effect’ as remaining locos were used harder, so failing in turn. September 2000: The boiler crisis had become so serious that the September Autumn Steam Gala was cancelled. September also saw picketing of oil refineries and fuel depots in protest at rising fuel prices (unleaded petrol having reached 80p per litre for the first time!). The October ‘Thomas’ weekend survived, with Jinty 47383 assuming the role of ‘Thomas’ and former resident Peckett 1738 Hams Hall No 4 re-visiting as 'Percy'. During the event, filming took place for the 2001 TV series “ Off the Rails” presented by Vince Henderson. October and November went on to be the wettest since records began 250 years earlier, with the Severn 22 feet above its normal level. November saw a stream at the top of Eardington Bank burst through its banks, with the resulting flood washing through the drainage in Knowlesands Tunnel. On 5 November this was overwhelmed, causing a major landslip at the Bridgnorth end with 3 lengths of track left hanging in space and the embankment spread across the field below. Repairs started once the stream was diverted, with the line re-connected around 3 weeks later. Coincidentally 25 November, the first day of through working after the repairs at Knowlesands, saw 8FThe British Railways system of classifying steam locomotives by power using a number from 0, least powerful, to 9, most powerful, followed by either F for freight, P for Passenger or MT for Mixed Traffic. 48773 involved in collision with a van on Northwood Crossing, fortunately with no fatalities involved. HM Railway Inspectorate later confirmed that the Railway was not at fault, independent witnesses having testified that the driver had passed the flashing red lights when the train was only a few yards from the crossing. Damage to the Astra van was rather more severe than to the 8FThe British Railways system of classifying steam locomotives by power using a number from 0, least powerful, to 9, most powerful, followed by either F for freight, P for Passenger or MT for Mixed Traffic..
December 2000: Concern at the fragile state of the fleet led to BRBritish Rail or British Railways Standard 9FThe British Railways system of classifying steam locomotives by power using a number from 0, least powerful, to 9, most powerful, followed by either F for freight, P for Passenger or MT for Mixed Traffic. 92212 arriving on hire for the Santa Services. The SVRSevern Valley Railway began the year anticipating a poor year financially, with the ‘boiler crisis’ affecting the capacity for previously profitable contract work. This was quickly exacerbated by the ‘Foot and Mouth’ crisis, with Government publicity initially advising the public to ‘stay away’. Advice later changed to ‘visit countryside attractions but don’t stray onto farmland’, but early season visitor numbers were badly affected. January 2001: All SVRSevern Valley Railway trains became non-smoking on 1 January 2001. 8 man-hours per week for 7 weeks were required to apply period style transfers to the windows of the coach fleet. Water quality was being constantly monitored, with samples taken for testing each time a loco was filled. ‘Reverse Osmosis’ water treatment equipment had been ordered, and was in course of being installed. Last year’s poor weather had resulted in a rock slide in Eyemore Cutting, just south of Victoria Bridge. Permanent repairs were undertaken in the summer once approval had been received from English Nature, the area being a Site of Special Scientific Interest (SSSI). March 2001: 9FThe British Railways system of classifying steam locomotives by power using a number from 0, least powerful, to 9, most powerful, followed by either F for freight, P for Passenger or MT for Mixed Traffic. 92212 attended the Spring Gala before leaving at the end of its hire period. Following the Gala, Bewdley Station was closed for 3 weeks for repairs to the footbridge and platform canopies. Visitors to the Railway included another HST on a Barnstaple to Bridgnorth excursion. Smaller locomotives guested at the Branch Line Weekend, with South Devon’s 1420 making a return visit accompanied by Auto Coach W225, and GWR Large Prairie 4144 attending from Didcot. 34027 Taw Valley returned to the Severn Valley Railway, with former owner Bert Hitchen selling the locomotive to the SVRSevern Valley Railway’s Phil Swallow. 34027 had been painted as ‘Hogwarts Express’ at the time, to promote the fourth Harry Potter book ‘Harry Potter and the Goblet of Fire’. The April Diesel Gala saw a visit from Virgin Trains’ Class 47 no 47828 which was given the name “Severn Valley Railway”. 8FThe British Railways system of classifying steam locomotives by power using a number from 0, least powerful, to 9, most powerful, followed by either F for freight, P for Passenger or MT for Mixed Traffic. 48773 became the first SVRSevern Valley Railway locomotive to achieve 100,000 miles in preservation, a feat at that time only achieved by two locomotives on the North Yorkshire Moors Railway. May 2001 On 23 May 2001 The Heritage Lottery Fund awarded the Kidderminster Railway Museum Trust Limited £177,500 for roof and canopy restoration, to provide additional storage space for the museum's collections and release further floorspace for new displays.August 2001: An area of land at Highley which was previously the colliery sidings came up for auction and was acquired by the SVRSevern Valley Railway. This area is now the site of The Engine House. September 2001: The Autumn Steam Gala featured the Princess Royal Locomotive Trust’s StanierWilliam Stanier, Chief Mechanical Engineer (CME) of the London, Midland and Scottish Railway 1932-1944 8PThe British Railways system of classifying steam locomotives by power using a number from 0, least powerful, to 9, most powerful, followed by either F for freight, P for Passenger or MT for Mixed Traffic. Coronation class 46233 Duchess of Sutherland, LMSLondon Midland & Scottish Railway Hughes ‘Crab’ 42765 from the ELREngineer's Line Reference, East Lancashire Railway and Dennis Howells’ Pannier 9466. February 2002: The Diesel Traction Group's D1015 Western Champion became the first ex-Western Region diesel hydraulic to make a main line comeback, hauling a Paddington – Bristol- Gloucester – Paddington rail tour. Spring 2002: A new loco pit was constructed at Bewdley MPD. The previous pit was not sufficiently deep to allow MPDMotive Power Depot staff to stand underneath the locomotives, and was prone to flooding. A similar enlargement of the Bridgnorth loco pit had taken place the year before. The Spring Gala had a ‘Somerset & Dorset’ theme, with locomotives renumbered as former S&DJRSomerset & Dorset Joint Railway inhabitants. Standard 4MTThe British Railways system of classifying steam locomotives by power using a number from 0, least powerful, to 9, most powerful, followed by either F for freight, P for Passenger or MT for Mixed Traffic. 75014 was the guest. On 24 March, L&Y class 25 0-6-0 No. 957 (BRBritish Rail or British Railways 52044) worked the 1.00 pm Kidderminster to Bridgnorth service, double headed with 46443. The test run followed a contract restoration which began in summer 1997. The SVRSevern Valley Railway hosted more unusual visitors in the form of a 4-car Virgin Voyager which was clearance-tested along the SVRSevern Valley Railway line, and a Parry People Mover which spent 2 months being tested (the PPM is now used on the Network Rail branch line from Stourbridge Junction to Stourbridge Town). June 2002: English, Welsh & Scottish Railway Class 60 locomotive No 60089 was named "The Railway Horse" in a ceremony at Bewdley on 8 June 2002..
Summer 2002: An application was made to the Heritage Lottery Fund for grant aid for a new museum and storage building at Highley (this would become The Engine House later in the 1980s). September 2002: To celebrate the Royal Jubilee, the guests at the Autumn Steam Gala were 46233 Duchess of Sutherland and 46201 Princess Elizabeth. October 2002: 686 The Lady Armaghdale travelled to Holland for the first ever continental ‘Thomas’ event. December 2002: The year closed with a record number of 236,704 passengers carried. March 2003: The Spring Gala was based on a Welsh Branch Line theme. Visiting locomotives were Taff Vale Railway 0-6-2T no 85 from the Worth Valley Railway and GWRGreat Western Railway CollettCharles Benjamin Collett, Chief Mechanical Engineer (CME) of the Great Western Railway 1922-1941 5600 class 0-6-2T no 5637 from the East Somerset Railway. April 2003: 61994 The Great Marquess was bought by John Cameron from the family of the late Earl of Lindsay. Plans were announced that the locomotive would be overhauled at the SVRSevern Valley Railway, including the repair of the driving axle which had failed in 1997. May 2003: A ceremony was held at Bridgnorth Station on 1 May to commemorate the 40th anniversary of the closure of RAF Bridgnorth, the former RAF national service training centre at Stanmore ParkSummer 2003: The SVRSevern Valley Railway News ‘Boardroom Notes’ stated: “Although we will continue to monitor the position, the possibility of a connection to Ironbridge is now unlikely since the BRBritish Rail or British Railways Residual Property Board has apparently concluded that there is no requirement for a railway north of Bridgnorth and has put Bridgnorth tunnel up for sale.” The Railway was commited to an number of other capital projects at the time, including Highley Museum, for which Stage 1 Heritage Lottery Fund approval had recently been received, and construction of the final wing of Kidderminster Station. Autumn 2003: Considerable discussion took place with Shropshire County Council over plans to build part of the National Cycle Route 45 on the SVRSevern Valley Railway property between Hampton Loade and Highley. Agreement was eventually reached for this to proceed. September 2003: Autumn Steam Gala visitors were LBSCRLondon Brighton & South Coast Railway Stroudley A1X Terrier ‘Knowle’ (BRBritish Rail or British Railways 32678) from the Kent & East Sussex Railway and BRBritish Rail or British Railways Standard 5MTThe British Railways system of classifying steam locomotives by power using a number from 0, least powerful, to 9, most powerful, followed by either F for freight, P for Passenger or MT for Mixed Traffic. 4-6-0 no 73096 from the Mid Hants Railway. 6201 Princess Elizabeth was also on the Railway at the time. During the year the total mileage since opening day in 1970 exceeded 1.5 million miles. Another year of record passenger numbers saw more than 248,000 carried. Victoria Bridge was closed until April for a major overhaul, which included replacing the 1970s bridge deck timbers with reinforced steel mesh. The closure of this section of the line meant no Spring Gala was held, and ultimately resulted in a fall in the number of passengers carried compared with the previous year’s record. The bridge was re-opened by a young lady named … Victoria Bridge! Locomotive 5164 entered service for the first time since 1984 after completion of overhaul. Bridgnorth station footbridge was re-installed. It had previously been taken down and moved to the boiler shop for shot-blasting and repainting. August 2004. Steeplejack and TV personality Fred Dibnah arrived at the SVRSevern Valley Railway complete with traction engine, riding van and BBC film crew. He spent a considerable time in the machine shop and boiler shop, so much so that he missed the chance of a footplate ride! The visit was featured in the series Fred Dibnah's Made in Britain. September 2004: The Autumn Steam Gala saw 12 locomotives in use, including visitors SRSouthern Railway MaunsellRichard Maunsell, Chief Mechanical Engineer (CME) of the South Eastern and Chatham Railway from 1913-1923, and of the Southern Railway 1923-1937. V ‘Schools’ class 4-4-0 No 30926 Repton and SRSouthern Railway USA Porter ‘Dock Tank’ 0-6-0T No 30070 liveried as DS 238. October 2004: The SVRSevern Valley Railway staged 'Railcar50' to celebrate the 50th anniversary of the introduction of Diesel Multiple Unit traction by BRBritish Rail or British Railways in 1954. The SVRSevern Valley Railway’s 5-car DMUDiesel Multiple Unit was joined by 16 visiting cars representing 12 classes of DMUDiesel Multiple Unit. The highlight of the event was the formation of a 12-car DMUDiesel Multiple Unit set which ran to Bridgnorth on the evening of Saturday 16th, eclipsing the previous 9-car record for the longest DMUDiesel Multiple Unit in preservation which had been set two days earlier. 2005 marked the 40th year of the SVRSevern Valley Railway in preservation. February 2005: The line was closed for two days between Bewdley and Highley following a rockfall in Eyemore Cutting. The fall was discovered by the crew of a footplate experience course special, who found the track blocked by a 'standard gauge' 4ft 8½ ins wide boulder. March 2005: The Spring Steam Gala took a Branch Line theme with guests GWRGreat Western Railway HawksworthFrederick Hawksworth, Chief Mechanical Engineer (CME) of the Great Western Railway 1941-1948 1600 class pannier tank 0-6-0PT no 1638 from the Kent & East Sussex Railway and LBSCRLondon Brighton & South Coast Railway BillintonLawson Billinton, Locomotive Engineer of the London, Brighton and South Coast Railway 1912-1923 E4 0-6-2T No 32473 Birch Grove from the Bluebell Line. 61994 The Great Marquess left the SVRSevern Valley Railway, moving to Crewe/Bury. The overhaul could not be completed by the SVRSevern Valley Railway within the timescale required by owner John Cameron. 5 carriages of the SVRSevern Valley Railway’s set of GresleySir Nigel Gresley, Chief Mechanical Engineer (CME) of the London & North Eastern Railway 1923-1941 Teak set were hired to the North Yorkshire Moors Railway for a celebration of the anniversary of Sir Nigel GresleySir Nigel Gresley, Chief Mechanical Engineer (CME) of the London & North Eastern Railway 1923-1941’s appointment as Carriage and Wagon Engineer on the Great Northern Railway, in return the NYMR sent 5 BRBritish Rail or British Railways(W) Mk1's in Chocolate and Cream livery to cover whilst the Teaks were away. Pannier 5764 hauled an excavator from Eardington to Country Park Halt for the firm constructing the nearby pedestrian/cycle-way bridge across the river. This was probably the first steam-hauled revenue earning freight since the closure of the line in the 1960s. 80079 was cosmetically restored and lent to the NRMNational Railway Museum for display at Shildon pending completion of the Engine House. May 2005: 686 The Lady Armaghdale made another overseas trip, this time for a ‘Thomas’ event in Krefeld, Germany. CollettCharles Benjamin Collett, Chief Mechanical Engineer (CME) of the Great Western Railway 1922-1941 1366 class 0-6-0PT Dock Shunter No 1369 from the South Devon Railway (the only other Pannier Tank with outside cylinders apart from the SVRSevern Valley Railway’s 1501). BRBritish Rail or British Railways(W) HawksworthFrederick Hawksworth, Chief Mechanical Engineer (CME) of the Great Western Railway 1941-1948 9400 class 0-6-0PT No 9466 courtesy of Dennis Howell. Taw Valley made a last gala appearance (as 34036 “Westward Ho”) before expiry of her boiler certificate. The SVRSevern Valley Railway announced the news that Heritage Lottery Fund approval had been given for The Engine House. In addition to HLFHeritage Lottery Fund (National Lottery Heritage Fund from 2019) funding of £3,364k, £948k was received from the European Union Regional Development Fund and £200k from Advantage West Midlands. 34027 (Running as 34036 "Westward Ho") made its last runs on public passenger trains during the 'Santa Special' season. She finally bowed out in early January 2006 on a private charter. Construction of The Engine House began. The Spring Steam Gala featured guest GWRGreat Western Railway CollettCharles Benjamin Collett, Chief Mechanical Engineer (CME) of the Great Western Railway 1922-1941 5101 Large PrairieLocomotive with a 2-6-2 wheel configuration No 5199 from the Llangollen Railway. June 2006: 6024 King Edward I visited the line for 4 days for a “Big Engine Weekend” which also featured one of the last appearances of 60009 Union of South Africa. John Cameron’s LNERLondon & North Eastern Railway A4 60009 Union of South Africa left the SVRSevern Valley Railway to join his other locomotive 61994 The Great Marquess in Scotland. The new Carriage Washing Plant adjacent to Kidderminster Carriage Shed was commissioned. The final ‘east wing’ of Kidderminster Station building was completed, together with the concourse roof. Following the previous year’s “GWRGreat Western Railway” gala, 2006 saw an LMSLondon Midland & Scottish Railway theme with visiting locomotives LNWRLondon & North Western Railway BeamesHewitt Pearson Montague Beames, Chief Mechanical Engineer (CME) of the London and North Western Railway 1920-1922. 7FThe British Railways system of classifying steam locomotives by power using a number from 0, least powerful, to 9, most powerful, followed by either F for freight, P for Passenger or MT for Mixed Traffic. Super DAn LNWR 0-8-0 goods engine 0-8-0 No 49395, LMSLondon Midland & Scottish Railway StanierWilliam Stanier, Chief Mechanical Engineer (CME) of the London, Midland and Scottish Railway 1932-1944 8PThe British Railways system of classifying steam locomotives by power using a number from 0, least powerful, to 9, most powerful, followed by either F for freight, P for Passenger or MT for Mixed Traffic. Coronation 4-6-2 No 46233 Duchess of Sutherland and LMSLondon Midland & Scottish Railway StanierWilliam Stanier, Chief Mechanical Engineer (CME) of the London, Midland and Scottish Railway 1932-1944 8PThe British Railways system of classifying steam locomotives by power using a number from 0, least powerful, to 9, most powerful, followed by either F for freight, P for Passenger or MT for Mixed Traffic. Princess Royal 4-6-2 No 46201 Princess Elizabeth. Colin Binch left the position of SVR General Manager after a short reign. Mr Binch was succeeded by a committee of three volunteers (Mike Ball, Roger Smith and Tony Bending) while a replacement was appointed. GWRGreat Western Railway 4566 made its first moves under its own power since 1995 following overhaul, 8 coach test runs were made between Highley and Bridgnorth when the railway was closed to passengers. The Board formally adopted a maximum permitted line speed of 40kph (about 25mph). The year had seen the issue of ‘The Railways and Other Guided Transport Systems (Safety) Regulations 2006’ (‘ROGS’) in response to an EU safety directive and the outcome of recent high profile rail accident enquiries. ROGS allowed a number of concessions to ‘low risk’ heritage railways, provided they formally resolved to comply with the definition in ROGS and limit maximum line speeds accordingly. Shareholders in the two companies owning the SVRSevern Valley Railway's Class 50 Diesels, The Fifty Fund and Project Defiance, agreed to a merger. The new organisation, The Class 50 Alliance, assumed responsibility for maintaining and operating the locomotives from January 2007. January 2007: The New Year saw 1501 out of ticket. The locomotive was to be cosmetically restored prior to a period on display in the Engine House. March 2007: The Spring Steam Gala saw a return of former resident GWRGreat Western Railway CollettCharles Benjamin Collett, Chief Mechanical Engineer (CME) of the Great Western Railway 1922-1941 5101 'Large PrairieLocomotive with a 2-6-2 wheel configuration' No 4141. 4141 was at the SVRSevern Valley Railway between 1973 and 1988, but without being restored to working order. The Gala also saw a return visit from Somerset & Dorset FowlerHenry Fowler, Chief Mechanical Engineer (CME) of the Midland Railway 1909-1923, and of the London, Midland and Scottish Railway 1923-1933 7FThe British Railways system of classifying steam locomotives by power using a number from 0, least powerful, to 9, most powerful, followed by either F for freight, P for Passenger or MT for Mixed Traffic. No 88 (BRBritish Rail or British Railways 53808) from the West Somerset Railway. 600 Gordon was newly repainted pending a move into The Engine House later in the year. April 2007: The frames were cut for new build locomotive no 82045. 4566 was used on another steam-hauled revenue earning freight charter, taking a load of pipes to Trimpley Reservoir for Severn Trent Water. The 6-ton Smiths, Rodley steam crane was also used to unload the pipes. The Railway purchased ‘Hanbury Cottage’ adjacent to the Bridgnorth yard. 4930 Hagley Hall returned from display in Swindon ready to be displayed in The Engine House. The Board announced the appointment of Nick Ralls as SVRSevern Valley Railway General Manager with effect from 25 June. SVRSevern Valley Railway News also announced that the Engine House would open in August 2007 ‘barring a major unforeseen problem’. The new GM’s arrival would be less than one week after the worst event in SVRSevern Valley Railway history. Although a massive rebuilding exercise began at once, the line did not reopen fully until 21 March 2008. The damage also caused the opening of The Engine House at Highley, planned for 2007, to be delayed until the following year. For a more detailed description of these events, see 2007 Storm Damage. September 2007: An Autumn Steam Gala was held using the only section of line available, Kidderminster to Bewdley. However with the assistance of Network Rail and Tyseley Locomotive Works, 4936 Kinlet Hall and 4953 Pitchford Hall were able to make runs from Bewdley through to Birmingham Snow Hill. LNERLondon & North Eastern Railway GresleySir Nigel Gresley, Chief Mechanical Engineer (CME) of the London & North Eastern Railway 1923-1941 V2 60800 Green Arrow was another gala visitor. Bridgnorth staged a ‘mini-gala’ with cab rides aboard 42968 on the only 600 yards of track then available for use. On 10 March, the full length of the line was re-connected for the first time since the floods in June 2007. The last section to be completed was near Borle Viaduct. Friday 14 March saw Jinty no 47383 become the first engine to be moved into The Engine House. Two days later another 6 engines were moved in, numbers 7325, Midland Compound 1000 (on loan from the NRMNational Railway Museum), 600 Gordon, 4930 Hagley Hall, 80079 and 1501. Space was left for the final exhibit, 8FThe British Railways system of classifying steam locomotives by power using a number from 0, least powerful, to 9, most powerful, followed by either F for freight, P for Passenger or MT for Mixed Traffic. no 48773 which would be moved in later in the year after retiring from service. Easter weekend saw the line fully re-opened. On Thursday 20 March 7812 Erlestoke Manor, newly returned to service for the first time since 1985, hauled a re-opening special. Public services began on Good Friday 21 March, The first public passenger trains hauled by 7812 and 45110 from either end of the line carrying 'SVRSevern Valley Railway Re-opening Train' headboards, with The Engine House opening its doors on the same day. Guest locomotive Somerset & Dorset FowlerHenry Fowler, Chief Mechanical Engineer (CME) of the Midland Railway 1909-1923, and of the London, Midland and Scottish Railway 1923-1933 7FThe British Railways system of classifying steam locomotives by power using a number from 0, least powerful, to 9, most powerful, followed by either F for freight, P for Passenger or MT for Mixed Traffic. No 88 (BRBritish Rail or British Railways 53808) from the West Somerset Railway was again present. Spring 2008: Ownership of 600 Gordon was transferred from the British Army to the Severn Valley Railway. A formal presentation ceremony later took place on Friday 25 July. May 2008: DMUDiesel Multiple Unit car M51935 was severely damaged by fire in what was believed to be an arson attack. The DMUDiesel Multiple Unit group later acquired powered car M50933/53933 as a replacement. 10 June saw the Railway visited by Their Royal Highnesses Prince Charles and the Duchess of Cornwall. The Royal Train was hauled from Kidderminster to Bridgnorth by 6024 King Edward 1, as the SVRSevern Valley Railway had no working locomotive equipped to work with air-braked stock. The Bridgnorth MPDMotive Power Depot had just carried out a successful emergency repair to 6024’s front bogie, so 6021 Princess Elizabeth was also present at Kidderminster as stand-by locomotive. GWRGreat Western Railway 3200 ‘DukedogA GWR 9000 Class 4-4-0 engine, rebuilt using earlier 3300 Class 'Bulldog' frame and 3252 Class 'Duke' boiler.’ class No 9017 Earl of Berkeley arrived on the SVRSevern Valley Railway from the Bluebell Railway for repairs to its valves, a visit which lasted continued past its appearance at the Autumn Steam Gala. July 2008: Partially completed replica locomotive ‘Catch Me Who Can’ was steamed in Severn Park at the ‘Trevithick 200 Rally’. A number of other working replicas attributed to Trevithick and his associates also took part. The locomotive also attended an open day at Barrow Hill Roundhouse. 11 August saw the 40th anniversary of 45110 hauling the ‘Fifteen Guinea Special’ to end the use of main line steam by British Railways. The locomotive had been granted a 6 month boiler certificate extension in order to be able to celebrate the occasion, and afterwards saw out the final few weeks running as 45134. Once out of service, 45110 was moved to Barrow Hill Roundhouse for a period on display there. An unseasonably wet August put the Railway’s new flood repairs to the test – the infrastructure survived well. 8FThe British Railways system of classifying steam locomotives by power using a number from 0, least powerful, to 9, most powerful, followed by either F for freight, P for Passenger or MT for Mixed Traffic. 48773, which had ended service, was moved into The Engine House following a cosmetic restoration. Guests at the Autumn Steam Gala were two GWRGreat Western Railway Small Prairies numbers 5526 and 5542 (both of which worked with Auto Coach W228), and the two GWRGreat Western Railway double-framed 4-4-0 locomotives ‘DukedogA GWR 9000 Class 4-4-0 engine, rebuilt using earlier 3300 Class 'Bulldog' frame and 3252 Class 'Duke' boiler.’ 9017 Earl of Berkeley and 3440  City of Truro. New build replica 'Catch Me Who Can' had been fitted with its crosshead and ancillary controls, enabling it to operate statically in Bridgnorth yard with the driving wheels jacked off the rails. Hampton Loade’s Paddock Railway celebrated its 21st birthday since construction began with an assembly of 54 live 16mm scale steam locomotives. The line was closed between Bewdley and Kidderminster for an overhaul of Worcester Road Bridge (Bridge 2). The Engine House had received around 60,000 visitors by 3 November, well in excess of the budgeted number of 37,000. The frames for new build 82045 returned to Bridgnorth following drilling at Boro’ Foundry in Lye. The SVRSevern Valley Railway's success in recovering from the storm damage was marked by a number of awards in 2008, including the Transport Trust's 'Preservationist of the Year 2007', the Ian Allen Publishing 'Heritage Railway of the Year 2008' and the Heart of England Tourist Board 'Best Tourism Experience of the Year 2008'. January 2009: Highley Station was closed on January weekends while installation of the footings for the new footbridge were installed. March 2009: Unusually the Spring Steam Gala, rather than the Autumn Steam Gala, saw larger engines visiting. The visitors for the ‘Festival of Steam’ event were GWRGreat Western Railway 5029 Nunney Castle, LNERLondon & North Eastern Railway GresleySir Nigel Gresley, Chief Mechanical Engineer (CME) of the London & North Eastern Railway 1923-1941 A4 60007 Sir Nigel GresleySir Nigel Gresley, Chief Mechanical Engineer (CME) of the London & North Eastern Railway 1923-1941, BRBritish Rail or British Railways Standard 8PThe British Railways system of classifying steam locomotives by power using a number from 0, least powerful, to 9, most powerful, followed by either F for freight, P for Passenger or MT for Mixed Traffic. 71000 Duke of Gloucester and BRBritish Rail or British Railways Standard 7MTThe British Railways system of classifying steam locomotives by power using a number from 0, least powerful, to 9, most powerful, followed by either F for freight, P for Passenger or MT for Mixed Traffic. 70013 Oliver Cromwell. April 2009: SVRSevern Valley Railway Patron H.R.H. The Duke of Gloucester was unable to attend the official opening of The Engine House due to illness. The ceremony went ahead with The Lord Lieutenant of Shropshire officiating. An upgrade to the Bridgnorth loco shed was completed. The work involved included the installation of roller shutter doors, side windows to improve lighting, and an enclosed paint shop. An appeal was launched for funds to acquire and install a wheel-drop which had been located at the Leicester Midland MPDMotive Power Depot (shed 15C). The boiler of 7714 had for some time been giving concern, having been a ‘quick fix’ during the boiler crisis of 2000. In addition, 5164 was out of service for a mid-term overhaul. As a result, 4936 Kinlet Hall joined the SVRSevern Valley Railway on hire from Tyseley for the summer and autumn. July 2009: 7802 Bradley Manor carried a headboard bearing the legend ‘100,000 miles, Still Going Strong’ to celebrate achieving that mileage in preservation. 43106 was steamed again after a lengthy restoration. As 43106 entered service, 7714’s boiler finally gave out. On 19 August, the ‘rolling chassis’ of GWRGreat Western Railway 0-6-2T No 6634 arrived at Bridgnorth. SVRSevern Valley Railway News announced that the SVRSevern Valley Railway had reached an agreement with owners The Waterman Railway Heritage Trust to complete the overhaul of the ‘bottom end’ while Crewe completed the repair of the boiler. The SVRSevern Valley Railway would then bring the locomotive into use; with it being run on the SVRSevern Valley Railway for ‘a period deemed fair by both parties’. The deal appeared favourable to the SVRSevern Valley Railway as it would not involve the boiler shop or require space in the works on the jacks. The Autumn Steam Gala had a “Tank Engines” theme, with visitors GWRGreat Western Railway CollettCharles Benjamin Collett, Chief Mechanical Engineer (CME) of the Great Western Railway 1922-1941 0-6-2T No 5643 from Llangollen, LMSLondon Midland & Scottish Railway IvattHenry George Ivatt, Chief Mechanical Engineer (CME) of the London, Midland and Scottish Railway 1946-1948. CME of BR (London Midland Region) 1948-1951 2MTThe British Railways system of classifying steam locomotives by power using a number from 0, least powerful, to 9, most powerful, followed by either F for freight, P for Passenger or MT for Mixed Traffic. No 41241 from the Worth Valley Railway and GNRGreat Northern Railway GresleySir Nigel Gresley, Chief Mechanical Engineer (CME) of the London & North Eastern Railway 1923-1941 N2 No 1744 (BRBritish Rail or British Railways 69523) from the Great Central Railway. 4936 Kinlet Hall also took part. On 28 September 2009, the Monday after the Gala, 43106’s tender became derailed as it approached Hampton Loade station hauling a passenger train. There were no injuries. The RAIB later reported that the immediate cause of the accident was the flange of the leading right-hand wheel of the tender climbing over the right-hand rail. The contributory factors were that a spring had been replaced on the tender with one which was not of the correct type and that the track in the area had become distorted. The points at Hampton Loade had been damaged in the derailment, so a temporary repair to the track at Hampton Loade was made allowing ‘straight through’ running, although without the ability to pass trains anywhere between Bridgnorth and Arley. The points were reinstated the following January. 60163 Tornado visited the railway for 9 days of continuous working over the half term week. GNRGreat Northern Railway GresleySir Nigel Gresley, Chief Mechanical Engineer (CME) of the London & North Eastern Railway 1923-1941 N2 No 1744 had remained at the railway following the Autumn Steam Gala and also took part. The new (replacement) footbridge at Highley was installed on 12 October. On 21 October H.R.H The Duke of Gloucester made a visit to the SVRSevern Valley Railway, having been unable to attend earlier in the year, and opened the footbridge as well as visiting The Engine House. The two 0-6-0 locomotives 686 The Lady Armahgdale and GWRGreat Western Railway 813 both retired from service due to boiler issues. A table of locomotives used during the decade is shown below. Detailed mileage records were not published in SVRSevern Valley Railway News for the years 2005-2009; locomotives used in those years are marked 'X'. SVRSevern Valley Railway News unless otherwise stated. Locomotive mileages for 2000-2004 from SVRSevern Valley Railway News Issue 152 page 25 "SVRSevern Valley Railway Steam Locomotive Mileages 1990-2004 compiled by Graham Nangreave". ↑ SVR Website. Retrieved 24 January 2015. This page was last modified on 22 April 2019, at 08:50.